Location: Paul Elizondo Community Mental Health Clinic, 806 S. Zarzamora St. Thought, meant to show that knowledge of brain chemistry and personal choice are tools of self-empowerment. ​Feeling, meant to show the soulful hope of brighter day. The corn maiden, also known as Tonantzin or Mother Earth, uses traditional Aztec imagery to communicate present-day hope and healing. ​​The mural was restored in 2017. The restored mural is almost identical to the original, but the removable wooden panels were replaced with polytab so the mural would last longer. Brighter Days reads from left to right, like a book. Adriana conceptualized the mural in three sections: Thought (left), Action (center), and Feeling (right). When Adriana was still in the information-gathering stage for this mural, a healthcare professional showed her a triangle diagram divided into Actions, Feelings, and Thoughts to show that thoughts influence actions, actions influence feelings, and feelings influence thoughts. Adriana wanted to represent this cycle in a hopeful light: by educating ourselves about mental health, we can change our Actions and reach brighter days. In the Thought panel, a man lays on the ground in deep depression. Nerves, neurons and synapses wind around him, representing both the physical nature of the brain and the power of the brain to bind the rest of the body. Next to him stands a long line of people. In Adriana’s surveys, one respondent said: “I feel like a number, I feel like I’m always waiting in line.” Adriana met people who had taken a day of work and caught the bus just to be seen at the mental health clinic because lines were so long. She painted the line to honor this experience. Most people in the line have their backs turned to the man on the ground, but the third man in line (modeled by Ben Tremillo) has turned around and is holding a book. The book says that “recovery is a process” and has the words “management,” “treatment,” and “peer support,” terms Adriana learned when she attended support groups at the clinic. Pages from the book flutter around the people in line, explaining conditions like depression, bipolar disorder, and schizophrenia. This scene communicates that when people have more knowledge about mental health, they are better able to advocate for themselves and support their loved ones. Towards the right, wrapping around the wall’s center outcropping, pairs of hands reach out and clasp. This image is meant to communicate that help comes not just from doctors and nurses, but from family and friends. The center wall, slightly smaller than the others, is devoted to action. The central image is a man slowly standing up under the sun, with three birds soaring overhead. Adriana met a patient at the clinic who, because of his diagnosis, was not allowed to see his daughter. When Adriana handed him a visual survey, he drew himself in chains, kneeling on the ground. Adriana used this image, without the chains, and drew the man rising up to convey strength and hope. Sbe also included a tribute to one of the murals at the Cassiano Homes, which shows a man on a background standing up with an eagele behind him. The birds come from another visual survey, where a patient drew a bird in three stages of flight and wrote “ready, set, go.” Adriana made the man standing up look as though he was opening his hands as he stood, releasing the bird to take flight from darkness to light. The bird is flying from the Thought section, through the Action section, and towards the Feeling section. The Feeling section shows a woman with her face lifted towards the sun, gazing at the corn maiden. Adriana painted the woman’s smiling face because of a conversation with a clinic patient whose medication left her unable to care for her children. “I would like to see a woman with hope in her eyes,” she told Adriana. The green vegetation around the woman’s head shows the promise of growth and a new life. A hand from the Action section stretches into the Feeling section to show that the man is reaching towards brighter days. The corn maiden, modeled by Cardee Garcia, is a symbol of the Virgin of Guadalupe and Tonantzin, her Aztec predecessor. Both are life-giving mother figures. The corn maiden shows that nourishment as well as human support can bring healing. The colors in the mural alternate between hot and cold hues. This is especially noticeable in the body of the man in the Thought section (far left). The red tones represent manic states and the blues represent depressive states. Together, they show the extremities of different moods one person can experience. In the feeling section, these clashing colors begin to resolve. At first, blue veins shoot through the red-tinted arm that holds up the corn maiden but the hand is flesh-colored. Adriana resolved hot and cold colors into a flesh-colored hand to show that people can reach a place that is calm and stable, neither hot nor cold. Gerry Garcia was impressed with Adriana’s work on Lideres de la Comunidad and invited her to lead her own mural. Adriana agreed and learned afterwards that her wall would be San Anto’s largest mural to date. Not only would it occupy the most surface area, it was on the second floor of an elevated building. This mean Adriana and her crew would have to work on wooden panels and then use lifts to install panels, suspended just feet away from the heavily trafficked Zarzamora Street. Although the wall was intimidating, Adriana was determined to finish the project. She quit her job and took a substantial pay cut to work full time on the mural. From design to installation, the mural took 5 months to complete. Because the location for the mural was a mental health clinic, Adriana knew from the beginning that her mural would address mental health themes. She began to read pamphlets and diagnostic handbooks about mental health, and to research the history of mental health care on the Westside. Before designing the mural, Adriana and the San Anto team block walked in the neighborhood, explaining that they were going to paint a mural about mental health and asking people what they would like to see represented. Most people in the neighborhoods were open to almost any kind of design and eager to see a positive alternative to graffiti on the prominent wall. Adriana then conducted surveys inside the mental health clinic. In addition to attending support groups at the clinic and talking with people there, she passed out “visual surveys” to people in the waiting room that included a box for people to draw images of their own experience with mental health care and a comment box to explain the images. Some people wrote, while others just drew. Almost everyone was willing to give their input. Adriana also interviewed care providers at the clinic. Every image in the final mural was somehow derived from this fieldwork. Artists worked together to assemble wooden panels and painted the mural inside Andy Benavides’ 1906 Gallery. After painting, these panels had to be installed outside the second floor of Commissioner Paul Elizondo Community Mental Health Clinic with cherry lifts and power tools. It took 34 8’ x 4’ wooden panels to fill the approximately 960 square foot wall. San Anto opted for wooden panels because painting directly on a brick wall would have affected the texture of the mural, and the artists would have had to paint on ladders and scaffolding almost directly above a busy street. Unfortunately, the wood panels began to decay as the mural approached its ten-year anniversary. Some panels started to come loose, posing a safety risk. In 2017, Rhys Munro and Michelle Love, with the assistance of Marisol de la Garza, restored Brighter Days. They painted on polytab panels and adhered the polytab to the wall with Novagel. Rhys and Michelle left the design exactly the same, except for adding cameos of themselves as the people waiting in the front of the line on the left side of the mural. Adriana first worked with San Anto Cultural Arts as a volunteer on the mural “Lideres de la Comunidad,” where she painted the portraits of her uncle Rudy “Diamond” Garcia and her grandfather, Rudolfo “Don Fito” Garcia. 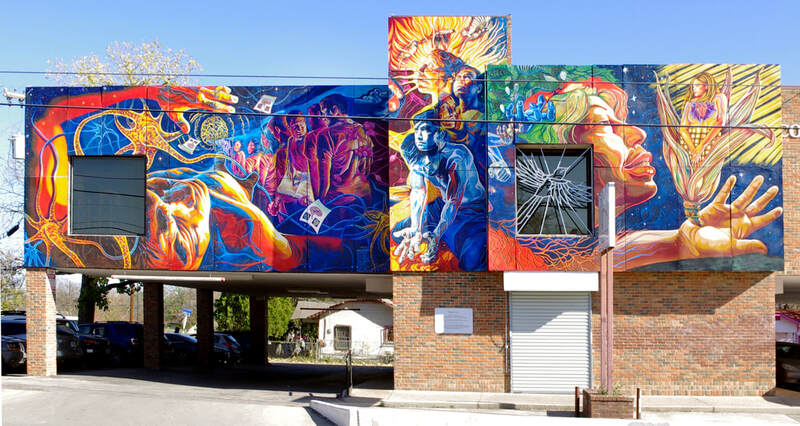 Adriana went on to lead Brighter Days, San Anto’s 36th mural and also one of its largest. After Brighter Days, Adriana assisted on several other murals, including La Musica de San Anto. Adriana has also been a key leader at San Anto, serving as a board member and Interim Executive Director. Learn more about Adriana’s artistic career on her website.